Nisful Sha’aban, or Laylatul Bara’at, is a special night in which our physical and spiritual provisions in the year to come will be set. Followers of tariqahs treat this as a very special night, it is mentioned in Naqshbandi teachings, and in Imam Ghazali’s ‘Ihya Ulumiddin’ and also in Shaykh Abdul Qadir Jilani’s ‘Sufficient Provisions for Seekers of the Path of Truth.’ However Salafis and Wahhabis pour scorn on such practices, and you will find the internet filled with articles written by them, condemning the practices of this special night. We are in the dark ages of jahilliyah again now, Maulana says, so it is no surprise that Muslims themselves are turning away from the practices of those Soliheen of before. 1) Take a sunnat bath before sunset, followed by a 2 raka’at prayer of tahiyyatul wudhu (ablution). 2) At azan, if you are fasting, break your fast with a very light meal. 3) Pray maghrib prayer, followed by recital of three Surah Yasins. After completing the first recitation of Surah Yasin, do’a for rizq/sustenance, ask Allah to make it easy for you, and that you are dependent on Him, and not on creation, for your rizq. After the second recital of Surah Yasin, do’a for protection from Bala’, troubles, misfortune, problems and disasters. After the third recital of Surah Yasin, do’a for a long life in faith, and filled with good deeds done sincerely for Allah. 4) You may then eat if wish to. 5) Those who have the Prophet’s hair/beard may then view it, and perform a 2 raka’at prayer of thankfullness (shukur) after that. 7) After this, pray a special prayer called Solat Al-Khair. It is a 100 raka’ats prayer, with the recital of 1 Surah Al-Fatihah and 10 Surah Al-Ikhlas in each raka’at. You may pray it singly or in congregation. You may pray it standing or sitting (if you are tired). You may prayer 50 sets of 2 raka’at prayers, or 25 sets of 4 raka’at prayers, though the first option is better. Our beloved Shuyukh, used to prepare a matchbox with 50 matches, and after each 2 raka’at prayer, he would remove one matchstick. When the box is empty, you would have completed the 100 raka’at prayer. In the second raka’at, you read 1 Surah Al-Fatihah and 1 Surah Al-Ikhlas. In this way, you complete the 100 raka’ats, and 150 Surah Al Ikhlas. You then complete the balance 850 Surah Al Ikhlas, outside the prayer, later on, throughout the night. The aim to to complete 100 raka’ats, and 1000 Surah Al Ikhlas during the course of the night. 9) Maulana said to be very careful to do your best to do this Solat. Whoever does it, will be protected from misfortune, wars, sufferings, heaviness and burdens in that year. They will not suffer from poverty, and the doors of akherat will open for them in this dunia. They will have a good death (husnul khotimah), they will see Prophet (saw) before they leave this world, and they will leave this world with lighted faces and be written as one who leaves this world in faith (iman), and they will not leave this life before seeing their maqam (station) in Akherat. 10) Maulana taught us this doa for the night. O our Lord, send us the Sultan. O our Lord send us a Sultan who will destroy the Sultanate of shaytan. Let us reach the good days that are coming. Do not imprison us in the land of unbelief (kufr). Grant us that we may be in the land of Islam, that we may live in the land of Islam and be buried in the land of Islam. O our Lord, grant hidayat (guidance) to our children, may their integrity and honour be protected. May they live with Your acceptance. May they be from those who make servanthood to you. May their faces be enlightened and may their hearts be pure. May their end be in a good way. Whoever makes do’a for us, O our Lord, accept their prayers as well. Accept our prayers as well and don’t confine us in bed. And don’t allow us to be stuck in hospitals with illnesses. Don’t make us from the ones who will have the torments of the grave. Give us the safety of faith (iman). Make our hearts cleaned from all bad attributes of the ego. O our Lord, for the honour of those who come to Your Divine Presence with an enlightened face, accept us as well. Make the station of the Prophet (saw) higher and exalted. May his flag rise always, may East and West be dressed with his flags. May all the people who are against Islam, disappear and be lost. Whoever loves Islam, may they rule from East to West. May they raise the flags of the Prophet (saw) upwards, endlessly. O our Lord, we have entrusted our integrity, our honour, our faith and our deen (religion) to You. O our Lord, our family and our children do we entrust to You, and our end is entrusted to You, O our Lord who sees everything! O our Lord, who knows each and every situation of ours, forgive us! Protect us from falling into wrong ways. Our religion and faith, our integrity & honour have been entrusted to You. O our Lord we entrusted them to Your Prophet (saw) and to Your saints. May the station of the Prophet (saw) be raised higher and higher. May the Master of time (Sohibul Zaman) come, and may the sultanate of shaytan be destroyed. 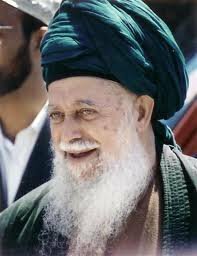 May the Sultan of Islam come, and we may we reach to those happy days. O our Lord, protect our families, our children and our people from the wars. Don’t leave us hungry and thirsty, don’t leave us in the fires. Aman ya Rabbi, Al Aman ya Rabbi, Al Aman ya Rabbi, You are Subhan, You are Sultan. O our Lord, we have surrendered to You & to Your Beloved Prophet (saw). Don’t allow us to part from Your Beloved’s (saw) way. Make us from the nation of Your Beloved (saw), whose faces are enlightened, ya Rabbi, Amin. Amin. Amin. Make us be partners with your good servants in their prayers and do’as that they perform in this night, and honour us with their company. Amin, amin. Protect us and the nation of the Prophet (saw) from the darkness of this year. Bihurmati man anzalta alayhi, surat al Fatiha. This entry was posted in Maulana Shaykh Nazim's Suhbahs and tagged Nisful, Sha'aban. Bookmark the permalink.